The upcoming closure of the Leopold Retirement Residence in downtown Bellingham has come at a huge cost to its residents – including many veterans. About 80 retirees were living at the Leopold when the closure was announced on Dec. 21, 2018, and 14 of them were veterans. All residents must be out by March 31, 2019. Many have already relocated but have had to pay high moving costs; many of these facilities are retirement homes that are more expensive. Local media covered some of the efforts to help Leopold residents find new homes. The untold story is the retired vets who have suffered and will continue to suffer financially, from the transition. Retired veteran Glen Hawley, 88, has a firm handshake even with a three-fingered hand. His wife has several health problems and is unable to walk. He and his wife moved into the Leopold just 3-months before the closure announcement. Hawley calls the closure an eviction, and says many residents were upset about getting this notice 4-days before Christmas. He believes Leopold management knew about the closure earlier and should not have let new residents move in only to kick them out 3-months later. Moving out of a building like the Leopold often requires hiring a professional moving company, and Hawley says for many residents it costs about $500 to move. For Hawley and his wife, it is expected to cost around $800. A flyer posted in the elevator at the Leopold says the company can “coordinate volunteers” to help residents move; so far nobody has reached out to offer to help them move. Retired veteran and Leopold resident Frank Edwards, 70, uses a wheelchair to get around. He has a big scar on his right knee where doctors put in a titanium kneecap and is in constant pain. Edwards has lived at the Leopold for 3-years. Like many disabled vets he has been homeless in the past and worries that he may be sleeping in his car again after the Leopold closes. The increasingly high cost of housing in Bellingham does not help the situation either. Hawley and his wife are moving to Solstice Senior Living (formerly known as the Parkway Chateau), and will cost them $1,000 more, per month. Without financial resources, Edwards cannot just move into another retirement facility. He says the more affordable retirement homes have no-vacancies, and they often do not include the same features that the Leopold had, such as hot meals and electricity. Edwards commented that social services such as what the Opportunity Council and VA provide, do not provide enough assistance for vets like him to live there. Bob Hall is the principle owner of the Leopold Retirement Residence – located at 1224 Cornwall Ave. – cited rising costs and declining occupancy as the reasons for the closure. Executive Director Peter Frazier has said they would hire a housing specialist to help our residents and their families in the transition to new homes. The building was built in 1929 as a hotel and is listed on the National Register of Historic Places. 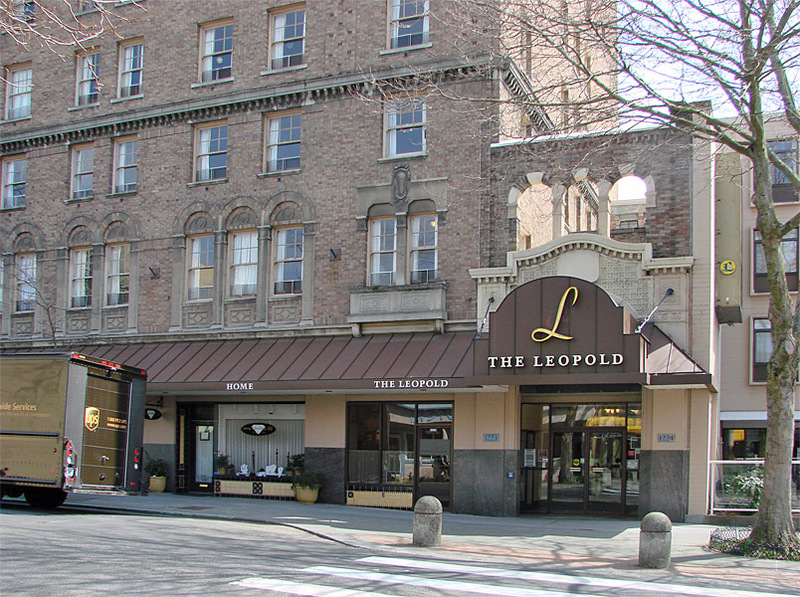 The owners of The Leopold are expected to announce their future-plans for the building this Spring.